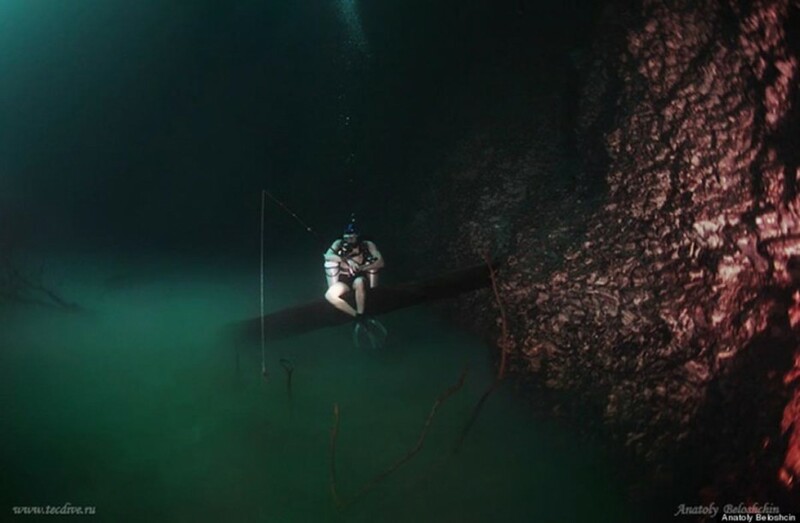 These striking photographs reveal a perplexing phenomenon in an underwater cave in Mexico, the Cenote Angelita (“Little Angel”). The cavern was formed by a rock collapse and over time the sinkhole began to trap both fresh and salt water deep within its fissures. At over 180 ft (55 m) deep, the mysterious waters provide explorers with a surreal experience. From the surface, this looks like an ordinary small body of water. Fresh water fills the first 100 ft (30m), but as one dives deeper they come across the most mystifying view, a hazy layer of hydrogen sulfate, which separates the divers from the deeper salt water. This phenomenon is called a halocline, in which fresh and salt water meet causing a sharp change in the salinity gradient of water. Haloclines are commonly observed in underwater caves located near the ocean. 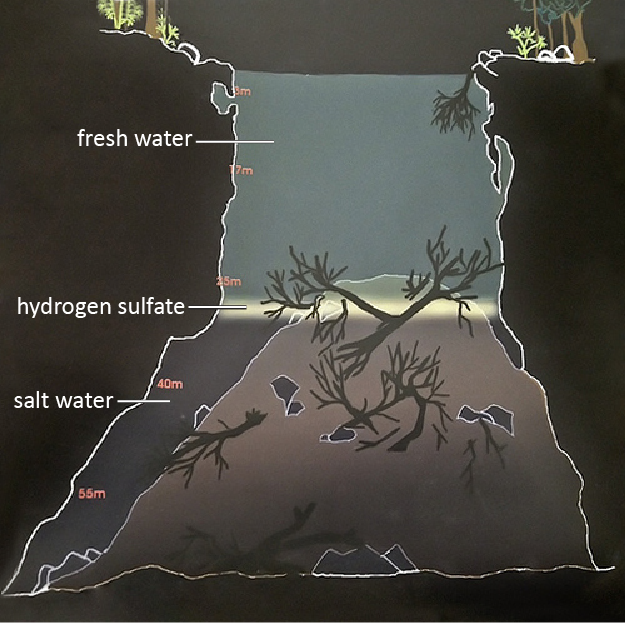 Fresh water originates from land creating a layer overlying the dense salt water accumulated from the sea. This causes an optical illusion in which the underwater cave appears to contain an unexplainable air cavity. 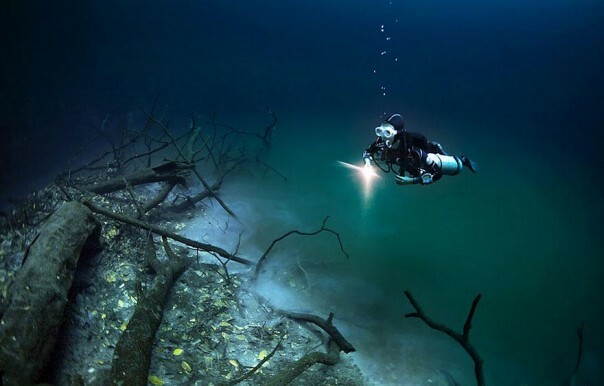 Is it really an underwater river? In short, no. The weight of hydrogen sulfate causes it to sink below the fresh water giving it the appearance of another body of water. Trees, leaves, and other debris cover the “banks” at the bottom of the fresh water layer, which resemble a riverside. The layer of hydrogen sulfate is heavy enough that it is able to move independently of water, thus appearing as a river with its own current. Interested in visiting? 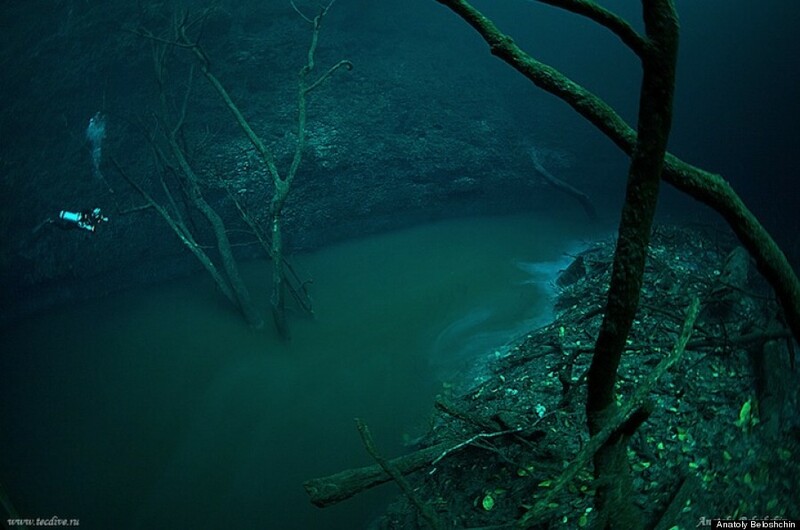 This area and many other cenotes are a diver’s dream. Check out more epic underwater photography courtesy of Anatoly Beloshchin. Enter your email address to subscribe to this blog. You'll receive notifications of new posts via email!